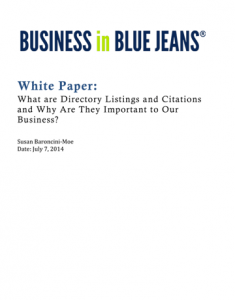 White Paper – What are Directory Listings and Citations and Why Are They Important to Our Business? Managing the online presence of any business is a challenge in today’s complex online world. But with online search skyrocketing 63% in the last twelve months, and a dramatic increase in people using smartphones to search for local services, maintaining an active, positive, consistent online presence is critical for business owners. What directory listings and citations are and how they’re created. Why they are such a problem for businesses. How they keep your patients, clients, and customers from finding you online and in the real world. Why directory listings and citation are so hard to manage and fix. How to start addressing the problems created by directory listings and citations. Yes, on my ownNo, we have someone managing it for usHUH? Yes!Yes, if you can explain what this means.No.I'm still confused.